The stars will be coming out this week. 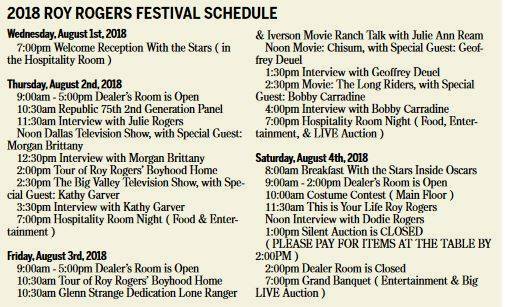 Stars of the big screen, including Robert Carradine, will be attending the 35th Annual Roy Rogers Festival starting Wednesday. The festival will begin on Wednesday evening with a reception of stars at the Portsmouth Holiday Inn and will continue at that location until Saturday evening with the finale being the Grand Banquet. 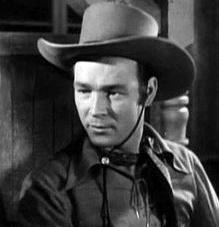 Roy Rogers, native of Duck Run Road, McDermott, was a huge sensation on the big screen for many years, playing in westerns. Rogers was known as the King of the Cowboys. Rogers was born Leonard Slye before taking on the stage name Roy Rogers. He attended McDermott High School. His boyhood home is a landmark on Duck Run today. Rogers attended many of the early festivals until age and failing health prevented him from making the trip from his home in California. Now, his family comes to support the festival in his name. Rogers’ daughter Dodie Rogers Patterson will be featured at the festival this year, along with Carradine, Julie Rogers Pomillia, Julie and Bob Ream, Geoffrey Deuel, Julie Ann Ream, Jon Patterson, Kathy Garver, Morgan Brittany, along with local performer Donna Cunningham. The festival, held at 711 Second Street, Portsmouth, in the Hospitality Room at Holiday Inn, will include vendors, banquet, live auction, look a like contest as well as great entertainment. Carradine, brother of Kung Fu star David Carradine, has had a successful career himself, most notably as Lewis Skolnick in the 1984 film Revenge of the Nerds. Carradine also played in the tv series Bonanza as well as playing along side John Wayne in Western movies. “Carradine is going to be a big hit,” Festival Board Secretary Adam Jones said. He noted several people have asked when he will be there so they can come and meet him. Jones also said Ohio Supreme Court Justice Mary DeGenaro has said she plans to attend Saturday. “Having a Supreme Court justice attend is huge,” Jones said. Rogers was born in Cincinnati Nov. 5, 1911. His parents’ home was located where the Reds Riverfront Stadium was located. According to Wikipedia, Rogers joked about growing up on second base. He passed away July 6, 1998 and was buried in Apple Valley, California.